I thought I was a great book salesman back in the day but I simply couldn't hold a candle or compete with the sales exploits of the former Mayor of Baltimore City, Cathy Pugh. 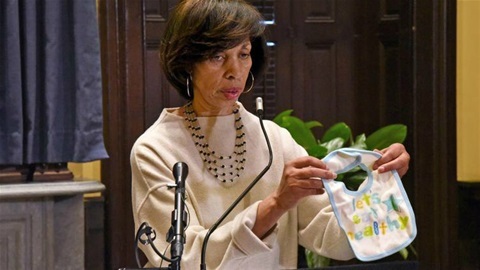 I am making the assumption that she will never return to Baltimore's City Hall. I mean she must have looked under every crack and crevice in Baltimore City and believe me Baltimore has plenty of cracks and crevices to sell those Horrible Holly books. Why in the hell didn't she stop? She had to know that once the stack of cards began to fall it would crush her? I understand one the 7 cardinal sins is greed but something must have overtaken her, the ease of the scam maybe? Now, Cathy Pugh is looking at possible serious jail time. In addition, her shady dealings may bring down some of the most influential power brokers in Baltimore City. The dirty oil that is coming off all these deals cannot be washed away with a leave of absence Ms. Mayor. You might as well get sized up for your prison gear but the barking, biting hounds of the legal system are knocking at the door. You will be able to get away from all this manure you created. You actually sold one, yes one Horrible Holly book for 100 grand, damn. How in god's name did you ever think you would escape the long arm of the law? It is definitely more than ethics violations. Horrible Holly has major criminal violations from both federal and state prosecutions coming. Way too much money involved to get away from doing a perp walk. It also is way too money involved for just you to be involved in the Horrible Holly scam. Goddamn Cathy Pugh, you absolutely stained the city you said you loved as well as ruined the reputation you had built as being honorable. Every day it seems for the past week in either the Baltimore Brew or the Baltimore Sun a new crime is attached to Horrible Holly. When will it end? Why did you attempt that news conference knowing in your mind the totality of the Horrible Holly scam? Now every deal you negotiated as a State Senator and Mayor is tinged and scorched with utter distrust and criminality. Wow. I am done Horrible Holly on putting Mayor Catherine Pugh on the run. Just think all the political tricksters you have surpassed? Just think of all the stories you can share with the prison inmates. I guess you can use Horrible Holly to teach literacy and health courses to your fellow inmates.